Mussels in a red wine sauce make an elegant appetizer for a dinner party or a quick meal to make for a weeknight. All you need is onion, garlic, tomatoes, fresh parsley, rosemary, and red wine for a rustic tomato and red wine sauce, and the best part is that it is ready in less than 30 minutes! Serve with some crusty bread to soak up the extra sauce. Try other fresh herbs, like thyme and tarragon in addition to or instead of the parsley and rosemary. Add red pepper flakes for a little heat. Squeeze lemon juice over the mussels just before serving for a fresh pop of flavor. Per Serving: 347 calories; 9g fat; 15.9g carbohydrates; 37g protein; 85mg cholesterol; 659mg sodium. I've only made mussels one other time, outside of this recipe. This version is so rich and delicious. I love the red wine flavors. I want to make this again very soon. Perfect with a rustic baguette! 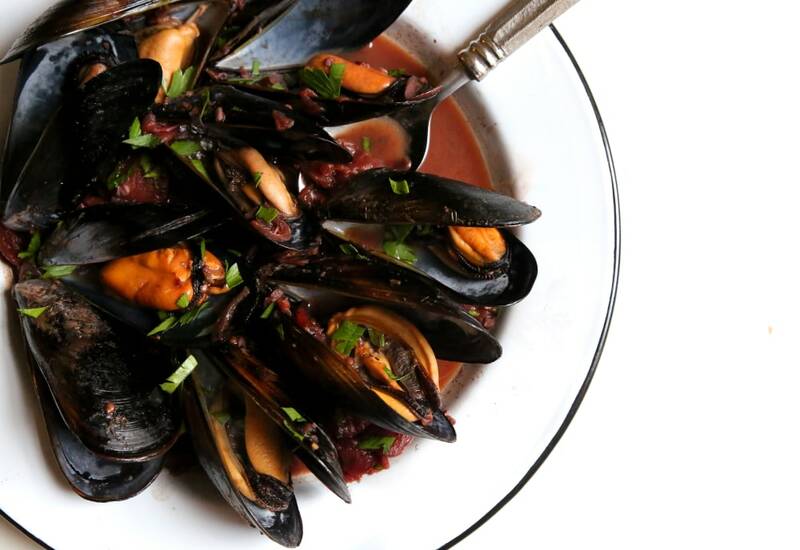 I'm such a sucker for seafood and these mussels really bring out all of those flavors that I love with the tomato and red wine. The fresh rosemary was also a really nice touch, especially since that is not an ingredient I cook with often. I might make this again for Valentine's Day.